We’re often hearing how important global growth is, so what better news than the fact that almost all of us are getting taller? 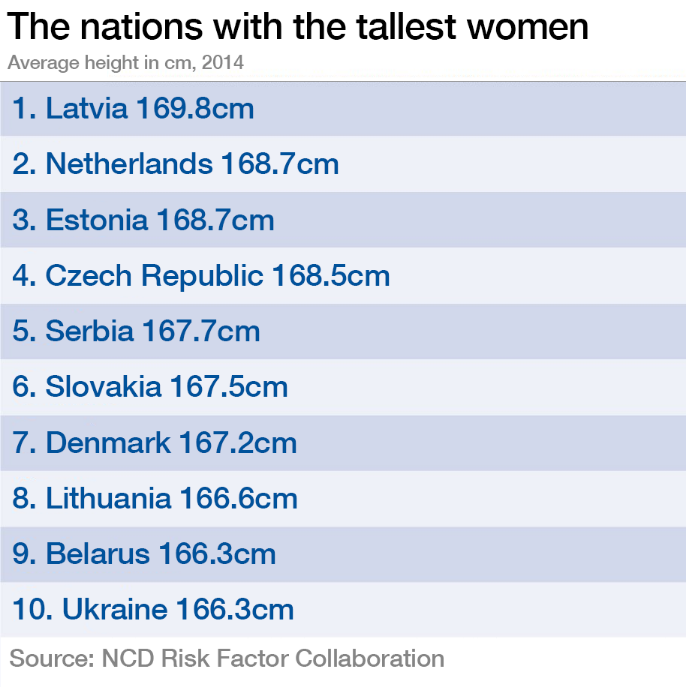 Both men and women have grown taller over the last century, with Dutch men and Latvian women now inching ahead of the rest of the world. The research, published in the journal eLife by the NCD Risk Factor Collaboration, shows that back in 1914 it was the Swedes who were the tallest people in the world. 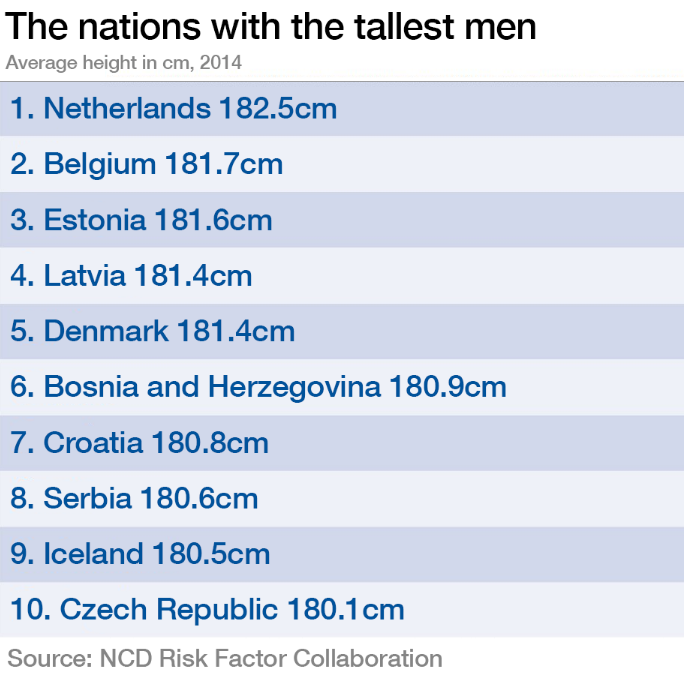 Since then Dutch men have risen up the rankings from 12th place to 1st with an average height of 182.5cm. Latvian women, meanwhile, rose from 28th place in 1914 to become the tallest in the world a century later, with an average height of 169.8cm. Other notable increases are South Korea’s women who have shot up by more than 20cm on average, and Iranian men whose stature has increased by 16.5cm. The study looked at the average height of 18 year old men and women in 200 countries between 1914 and 2014. European countries dominate the height chart, but the data also suggests that growth trends in the West may be levelling out. At the other end of the chart, the smallest men on the planet are to be found in East Timor at an average 160cm. The world's smallest women are in Guatemala, as they were in 1914. The average Guatemalan 18-year-old female is 150cm tall. Although some of the variation in height can be put down to genetic differences, it is not thought to be a dominant factor. Good standards of healthcare, sanitation, and nutrition are thought to be key factors, along with the mother's health and nutrition during pregnancy. 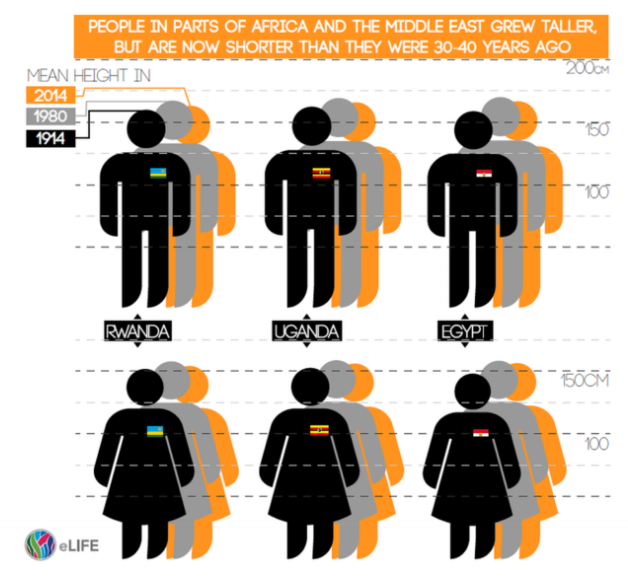 The role of nutrition is thought to be a key explanation for the fact that, although over the century there has been an increase in height in every country surveyed, in some places people are have been getting shorter again. “One reason for these decrease in heights in Africa is the economic situation in the 1980s,” Alexander Moradi of the University of Sussex, told the Guardian . The scientist, who was involved in the study, believes that the nutritional and health crises that followed the policy of economic structural adjustment in many African countries, led to many children and teenagers failing to reach their full potential in terms of height. Research has shown that height is correlated with positive health outcomes as well as a few negative ones. Tall people tend to have a longer life expectancy, with a reduced risk of heart disease, but there is some evidence that they are at greater risk of certain cancers, such as colorectal, postmenopausal breast and ovarian cancers. Have you read? Forget genes: it’s your zip code that influences your health Malnutrition affects one in three people, but starvation isn't the only culprit How can we end malnutrition?